On the beaches of Normandy in 1944, an interesting and important, although poorly reported vehicle was operating. This was the Sherman Beach Armoured Recovery Vehicle or ‘BARV’. One of the many ‘Funnies’ on the beaches, this modified tank was able to wade in up to 8ft (2.4m) of water thanks to an open superstructure shaped like a ship’s bow that replaced the turret. The role of the BARV was to assist in amphibious landings. It could push landing craft back out to sea or pull them into shore. It could pull tanks off the beach that have become stuck, and could even be used as an anchoring point for small vessels. 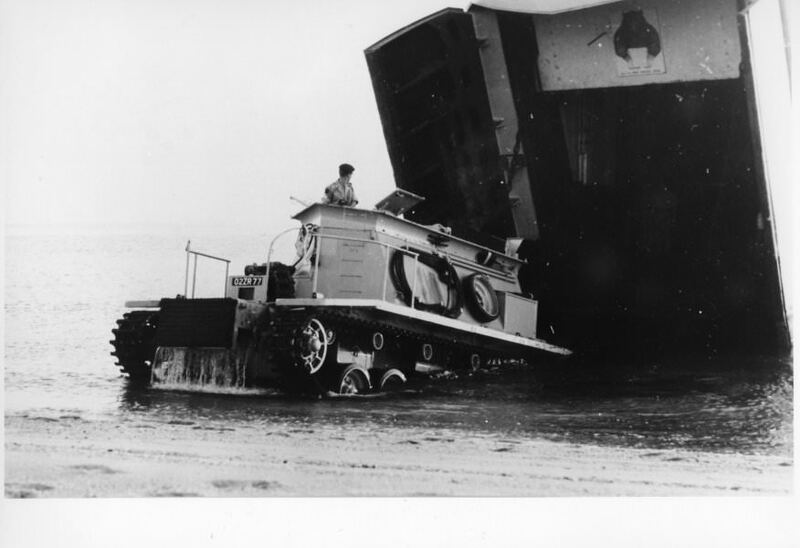 The Sherman BARVs were still in service in the mid-to-late 1950s, by which point it was becoming clear that the old Sherman was having trouble towing the heavier landing craft and vehicles coming into service. Work on a replacement would begin in 1956/57. It was logical that the replacement would be based on the British Army’s serving tank, the FV4200 Centurion, specifically the Mk. 3. The Centurion Mk. 3 entered service in the early 1950s. The standard main armament of the Mk. 3 consisted of the Ordnance QF 20-Pounder (84mm) gun. It had armor from 51mm up to 152 mm thick. The vehicle was powered by a Rolls-Royce Meteor engine producing 650 hp, and giving the tank a top speed of 22 mph (35 km/h). The tank’s weight of 51 tons was supported on a Horstmann suspension with three two wheel bogies per-side. The standard crew of the Centurion was 4 men consisting of commander, gunner, loader and driver. The Fording Trials Branch (FTB) of the Royal Electrical Mechanical Engineers (REME) were tasked with designing and building a mockup of a replacement for the Sherman in January 1957. 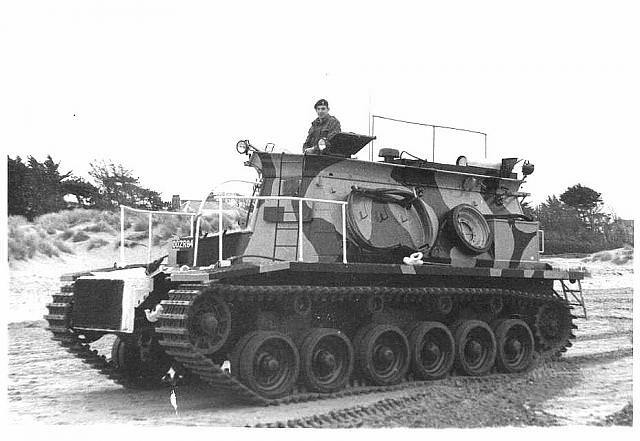 An obsolete Centurion ‘Tower’, a rare vehicle with a large winch mounted in place of the turret, was delivered to the FTB and a comprehensive course of design and development ensued. The hull was completely gutted except for the drive systems (engine, transmission, clutch, gearbox). The general arrangement of the driver’s position remained mostly unchanged. The unique upper hull, which was shaped like a ship’s bow or breakwater, was crafted from 5mm thick mild steel that was bolted to a simple frame. The complete prototype underwent its first test submersion in June 1957. After a series of further modifications, it was demonstrated on Instow beach, Devon, on the 4th and 5th March 1958. The design was approved and the prototype was sent to the Fighting Vehicles Research and Development Establishment (FVRDE) in Chertsey to finalize the development of the fully armored vehicle. A production contract was signed for 12 Centurion BARVs to be constructed at Royal Ordnance Factory (ROF), Barnbow in Leeds. The first production BARV arrived at Instow for user trials in February 1960. The trials proved successful, though a few minor modifications were requested and subsequently applied to the vehicles. The 12 BARVs, constructed on Centurion Mk. 3 hulls, were completed in 1963. They soon entered service. The superstructure was constructed from 25mm thick armor plate. Various pieces of equipment were stowed on the sides of the structure. This included pioneer tools, fire extinguishers, towing equipment and even a spare roadwheel. On the roof of the superstructure, at the front, was a large two-piece hatch. The commander would guide the driver from this hatch when the vehicle was submerged. The vehicle could operate in 2.9 meters of water, despite usual operating depth being around 2.4 meters. At depths up to 1.5 meters, the driver had direct vision via a laminated glass cube in the armored ‘hood’ over his position. The driving position was higher than that of the normal Centurion gun tank. On the BARV, the driver was in a position that would be equal to driving the gun tank ‘head-out’. The Commander’s roof hatch was the only point of entry for the entire crew. A ladder was added to the left front of the superstructure to allow the crew to climb up to the entry hatch. The probability of enemy fire against the BARV was high on an assault beach, and the 25mm thick armor was little protection. Any up-armoring was discounted however, as, in the case of the BARV, the best defense against such fire was to position the vehicle at its maximum submerged depth. For this reason, the side skirts found on standard Centurions were not added to the BARV. The complete engine and drive systems were moved into the back of the superstructure, barring the auxiliary motor which was deleted and replaced with a ‘Chore-Horse’ 300W 24V charging unit. This allowed all the systems to be easily accessible by the crew. In the initial pre-production model, wading and sitting in water up to its maximum depth presented problems with the air intake of the engine, the dispersal of exhaust fumes and also made refueling difficult. The refueling problem was solved by the addition of an 85-gallon tank nearer the roof of the superstructure with an external, watertight filler cap. The exhausts were moved to the top of the superstructure, venting over the rear. Air ventilation to the engine was provided via ducts provided by armored cowls behind the commander’s hatch. 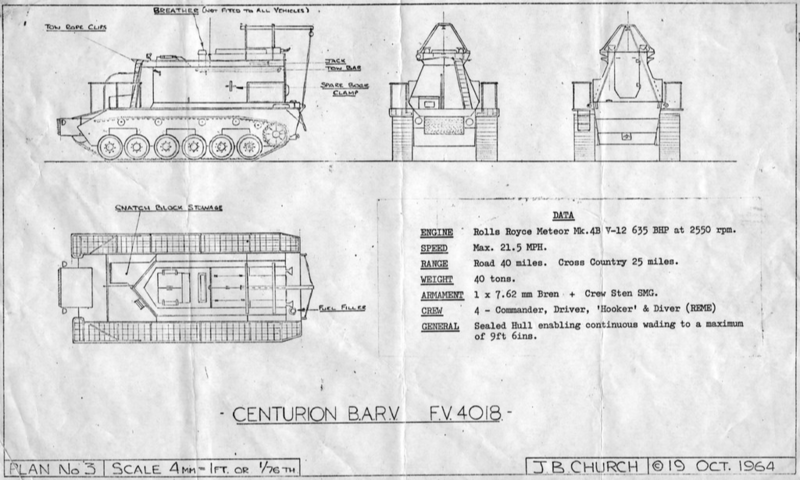 At 40 tons, (40.6 tonnes) the BARV became one of the lightest variants of the Centurion, thanks in part to the fact that it was extensively stripped down compared the gun tank. This lighter weight allowed the BARV to achieve speeds up to and over 30 mph making it one of the fastest version of the Centurion as well. 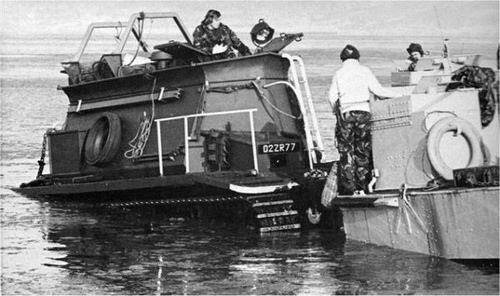 The very nature of the BARVs job required it to operate in soft ground and deep water where the effective weight of the vehicle was reduced to as low as 15 tons (15.2 tonnes). Because of this, all shock absorbers were removed as, otherwise, they’d need frequent servicing. The standard fenders over the tracks were removed in favor of heavy-duty wire mesh catwalks. Water passed through these catwalks with ease, reducing the buoyancy of the vehicle. Three handrails were placed on the fenders at the front of the vehicle, these were painted white to help the onboard diver (the crew of the vehicle will be explained in the following section) navigate back to the vehicle when working in murky or deep waters. The BARV had no winching equipment, most recoveries were achieved by a brute force tug. The vehicle could tug 28 tons (28.4 tonnes) on dry land, but every foot of water reduced this by 2 tons. A 2:1 pull could be achieved using a ‘snatchblock’ (a pulling block assembly which is used specifically to increase the load pulling capacity) that was stowed above the driver’s compartment. There was a wooden block at the front of the vehicle, often covered in thick rope. This was used to physically shunt stranded tanks up the beach, or push vessels back out to sea. There was a stowage bin behind this block used for further recovery equipment. The BARV had a four-man crew consisting of the Driver and Commander, accompanied by two recovery mechanics. One of these mechanics had to be a trained diver, this was unique to these vehicles. His tasks included attaching tow ropes to stranded vehicles, and cutting away any debris that may hinder the recovery process or get tangled in the tracks by means of an oxyacetylene torch. This was done in depths of up to 6.1 meters. He used two types of diving equipment consisting of pure oxygen and compressed air, both of which were stowed onboard the vehicle. The BARV carried its own lifting tackle. When not in use it was towed on the side of the superstructure. The lifting frame could be erected by the crew in an hour. This was used to remove the engine, clutch or gearbox from the large engine bay door at the rear of the superstructure with relative ease. The crew could achieve this either on board the ship it was stationed on or in the field. Each crew member was equipped with a 9mm Sterling submachine gun for personal defense. A 7.62mm GPMG (General Purpose Machine Gun) was also carried. 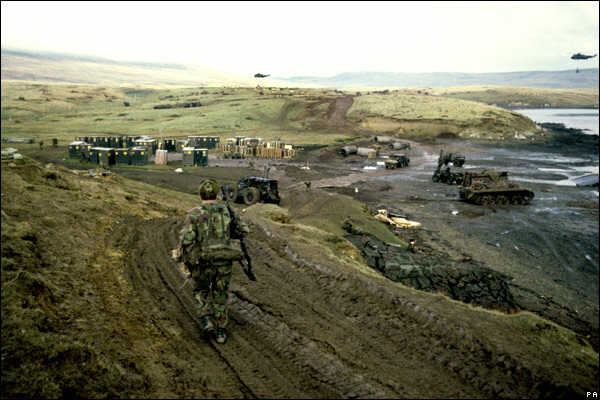 Manned by REME personnel, the BARVs saw extensive service with the British Army, mostly with the Royal Navy Amphibious Warfare Squadron in the Middle East. In operation in an amphibious landing, the BARV would be the first vehicle to launch and be used to keep the beaching channels clear of drowned or stranded vehicles. Recovery operations in support of landings was achieved in cooperation with a Michigan Light-Wheeled Tractor. The pair formed an ‘Amphibious Beach Unit’ or ‘ABU’. Two of these units, accompanied by a light dozer, 2 light trucks and two Land Rovers formed the ‘Army Beach Troop Royal Engineers’. When the British Army withdrew from the east of the Suez, assault landings became the role of the Royal Marines, who subsequently inherited the BARVs. The two amphibious assault ships, HMS Fearless and HMS Intrepid each carried a Centurion BARV with a Royal Marine crew. These two ships were ‘Landing Platform Docks’ or ‘LPDs’. With the cooperation of other Naval vessels and cover from the Royal Air Force (RAF), the ships could perform an amphibious landing anywhere in the world. In 1981, HMS Fearless‘ BARV was lost at sea off the coast of Browndown beach, Hampshire, during an exercise. It became fully submerged but was later recovered. Both HMS Intrepid and HMS Fearless, and one of their BARVs, took part on the amphibious landings of San Carlos Bay in 1982 during the Falklands War. The BARVs were the largest land vehicles ashore. HMS Fearless’ BARV caused more trouble, however, breaking its drive chain whilst working on Blue Beach. Serving with the Royal Marines on board HMS Ocean, the BARV would see its final days of service in the Second Gulf War of 2003. The BARV was the last Centurion to ever serve in the British Army. This variant of the tank extended the service life of the Centurion in the British Army to 56 years. The Centurion BARV was replaced in service by the Hippo Beach Recovery Vehicle (BRV), based on the Leopard 1. This BARV, 02ZR77, has the distinction of being the last Centurion to serve with the British Army. This unique camoflauge scheme is from its time in the Gulf War, serving aboard HMS Ocean in 2003. Photo: Royal Marines Museum. A few Centurion BARVs do still survive. One can be found at the Tank Museum, Bovington in their Vehicle Conservation Centre (VCC). It is a running vehicle, and is sometimes displayed at museum events. Another can be found at the Royal Engineers Museum in Kent. The Cadman Brothers, also of Kent, are in the process of privately restoring one. Crew 4 (commander, driver, 2x crew members). Haynes Owners Workshop Manual, Centurion Main Battle Tank, 1946 to Present. 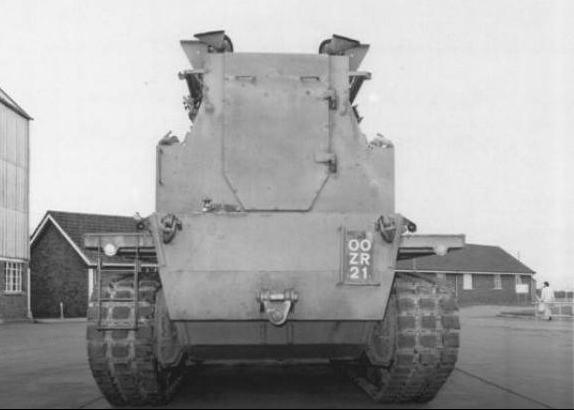 The FV4018 Centurion Beach Armoured Recovery Vehicle (BARV). Note the hand rails and ladder at the front, the spare roadwheel on the side of the boat-like hull, and the exhausts way up above the water line. Illustration by Jarosław ‘Jarja’ Janas, funded by our Patreon campaign. Hello, the detail on the Barv in 2003 is incorrect. It wasn’t on or from HMS Ocean. It was from 4 assault sqn who had joined up with 539 assault Sqn for the duration of the war. It was shipped to and from theatre on a civvi cargo ship. I seem to remember it being called the Shmidt Enterprise. It was never on the Ocean. Prior to Iraq it was on HMS Fearless before she was scrapped. The Barv was retired shotly after 4 assault returned to the UK. It was at RM Poole for a few months before being sold off. Do you have a source for this information? Its the first I’m hearing of it. There are two BARVs on display in Israel. One is in the IDF History Museum in Tel Aviv-Yafo, the other is at the Armored Corps museum and memorial at Latrun. The one at Latrun still carries what I assume is the British Army serial number, 04ZR49. I have photos of both and current access to them (I’m now serving in the US Defense Attache Office in Tel Aviv). 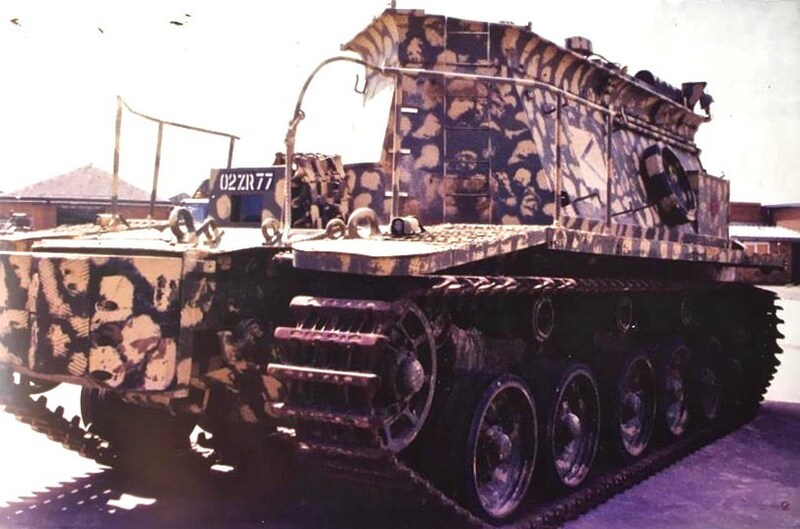 I have not been able to determine whether the IDF acquired these with an original intent to use them in their own amphibious operations, as museum display vehicles, or in a deal with other Centurions as sources of spare parts for their own Centurion tanks.